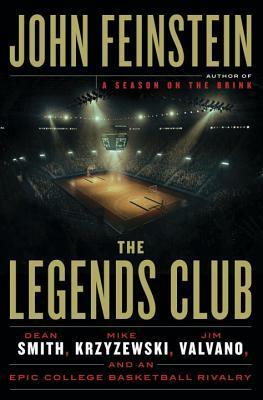 The Legends Club is John Feinstein's 36th book. He is the author of A Season on the Brink and A Good Walk Spoiled, both #1 New York Times bestsellers and Last Shot, which won the Edgar Allen Poe Award for mystery writing in the Young Adult category. He was inducted into the U.S. Basketball Writer's Hall of Fame in 2000; the National Sportswriters and Sportscasters Hall of Fame in 2011 and the Naismith Basketball Hall of Fame in 2013. He currently writes for The Washington Post and Golf Digest and is a regular contributor to The Golf Channel, Comcast Sports Regional Networks and hosts a college basketball show and a golf show on SiriusXM Radio. He lives in Potomac, Maryland with his wife Christine and is the father of three children, Danny, Brigid, and Jane. "The book is one of [John Feinstein's] best, a beguilingly personal, sometimes heartbreaking look at the psychic cost of doing battle in America’s most brutally, nakedly competitive (and actual) arenas. It makes a fitting bookend to the author’s first, “A Season on the Brink” (1986), his hair-raising exposé of Indiana coach Bobby Knight, expletives included." "A compelling story of the complex relationships and backyard rivalries of the three coaches who dominated college basketball during the 1980s and early ’90s...Feinstein’s relationship with all three coaches gave him the intimate details that form the backbone of the book. One story leads quickly to another story in this fast-moving account of a memorable era in college basketball. Dating back to Feinstein’s first interview with Smith, this book was nearly 40 years in the making. It was worth the wait, because it is one of Feinstein’s best." "Feinstein entertains readers with fair, objective observations based on fact and his unique inside access gained not only through years of his coverage but also through many new interviews with former players, coaches and administrators...In a famous speech before he died, Valvano implored all of us to attempt to do three things each day: laugh, think and cry. He would be pleased with “The Legends Club” because it will evoke all three from readers, no matter where their college basketball allegiances lie." "The legends are right there in the subtitle: Dean Smith, Mike Krzyzewski, Jim Valvano, and an Epic College Basketball Rivalry. The unbilled fourth legend is the author. His longstanding relationships with the principals give the book its insider appeal; his history with each man goes back decades, and the intersecting, layered looks at each are built on firsthand knowledge...Funny and smart." "Duke, UNC and N.C. State fans might quibble about the details, as they always do, Feinstein faithfully captures a rivalry that will remain a legend in sports."